Each Saturday night or Sunday morning we do menu planning for the upcoming week. We plan our menu around what we have, and what we think we might want to have for our dinners. This week I got the Mexican Vegetables option with my Bountiful Basket. It was a gorgeous collection of food that inspires so much food south of the border. This selection requires a much more adventuresome menu than Taco night. The package has more than you can incorporate in a single meal or two. Here are some of what we have planned. We had an assortment of Anaheim, Hatch and jalapeno peppers. Can you say Chili Rellenos? The avocados are calling to be made into some guacamole. 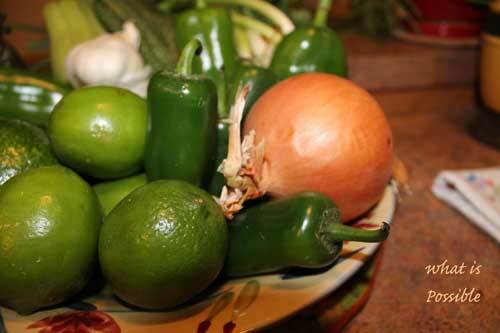 I will use some of the garlic, peppers, onion, lime juice and cilantro. The grey squash is going to be made up into Calabacitas con Queso. If you don’t know what this is you are missing something great. My Mexican collection included a Chayote. I have never have had one of these,and I have picked a recipe called Garlic-Chili Roasted Chayotes to try this new veggie. My chickens have started to lay again so Huevos Rancheros are on the menu for next weekends as brunch again. Not only will we cook Mexican, but we have some andouille sausage so Jambalaya is on the menu, as well as Cuban Black Soup. I am sharing this with you because we generally always buy and cook the same things. It is hard to justify buying things you have never worked with, but occasionally buy a single item you are unsure of. Challenge yourself when you get home to find a way to cook it on the net. You aren’t going to love them all, but you are going to try something new. You will likely find more things that you like than you don’t. Your menus will be a little less of the same old same old. Life will be a little less routine, a little less boring. This week in our bountiful basket there was two bunches of celery and we chose the Asian extra pack which gave us a third bunch. I had two partially used bunches in our produce drawer. Suddenly I had more celery than any one person or family could use. Like so often I turned to the internet to find a way use produce in a new way. 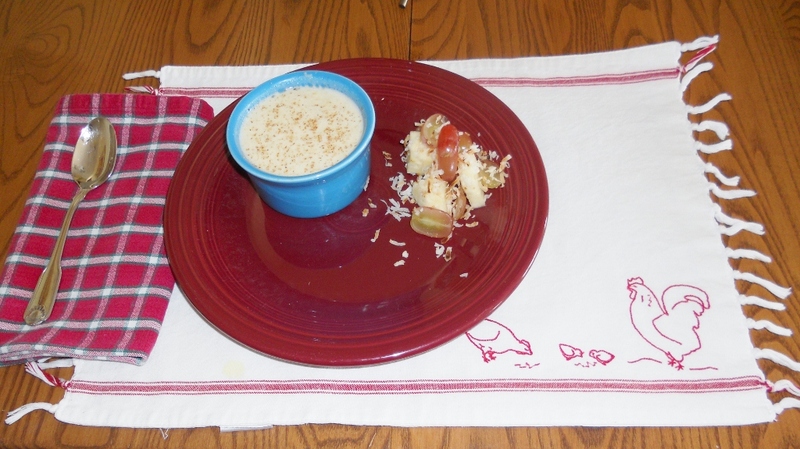 We found a highly rate recipe for cream of celery soup. I was unsure of this whole concept. All I could think of was the congealed mess that comes out of the soup can and used for casserole. I would never have imagined how great it was. Both my husband and I declared it a winner. Today was a holiday for my husband and me. We spent the day putsing around the house. Smoke blew in from a forest fire from who knows where and we knocked off early, both feeling a little under the weather. There has been lots of crud going around my husband’s office and the kind of smoke we had today can make anyone feel poorly. We had planned on having a nice dinner, but it quickly seemed to both of us that comfort food was more in order. I pulled things out of my refrigerator to make beef vegetable noodle soup. I was making it home-made, using the make-do philosophy. I think sometimes that kind of cooking is a lost art. The art of cooking from scratch, making do with what you have on hand. I had some left over short ribs, I had made in the slow cooker yesterday. I threw the meat from the ribs in a pan along with some water, a diced potato half a carrot sliced, and a small handful of bow tie pasta. While boiling away I sauteed a little onion and celery until they were clear and added that to the boiling veggies. Next I found a couple of tomatoes that were ready to be used and chopped them and poured them on top of the boiling mixture. It was now evident that my water was boiling away, so I pulled out the last of some V8 and found some gravy that we had made from the drippings last night. Both went in the soup. I found one collard green left in the refrig and pulled it out and chopped a little into the soup. Everything fresh I had on hand was in the soup, but it still did not say vegetable to me. Off to the freezer; there I found corn, peas and beans. I took a small handful of each and add the three to my soup and cooked until they were done. Ta’Da. Soup was on. Before we could sit down and eat soup, my husband got a call to report to work. It seems there is another forest fire tonight. I quickly heated up a wide mouth thermos and filled it with my soup. I am not sure when he will get to it, but I hope it is still warm. No matter what I am sure that my make-do soup will hit the spot. 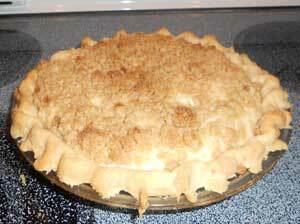 He will miss out on dessert though as it was still in the oven…creamy pear pie. He was bemoaning the fact that he was going to get none of that. This is a late season fire, let’s hope in spite of the dry weather it doesn’t go crazy and he can be home soon and enjoy his pie. Sometimes I think of our house as the Salvation Army of food. I say that because our friends seem to share not only their garden’s abundance they can’t use but those things that they get, they are not sure what to do with. My close friends know that I grew up in a home where we ate lots of small game that have never ate. They seem to think with this background that there is nothing that I can’t cook. Case in p0int every year we can depend on our friends who purchased a 4H hog to give us pork hocks. It seems to them that pork hocks are just unimaginable for use. I on the other hand have no problems with hocks. Unlike the hocks you would find in a grocery store these are large, wonderfully smoked and meaty. We turn out the standard fare Senate navy bean soup and a Caribbean bean black bean soup that can’t be beat. Sometimes there is enough good smoked pork to make scalloped potatoes on one of those hocks. Two days ago our 4H hog buyer gave us pork neck bones. This cut of meat is not something you find every day at your supermarket or local butcher shop. Even I was a little befuddled as to what one does with this. I ended up cooking them all day in the crock pot. Then I deboned the meat and made with a red lentil and yam soup. It was pronounced a keeper by husband. It was a North African recipe and had a bit of feel of a curry. I served it the next day to a guest for lunch. It was a nice the second time around. Thanks to my mom who would cook anything my dad brought home. Thanks to my granny who said eat one bite of it, you don’t yet know if you don’t like it fixed this way. Thanks to my grandma who cooked Sunday night dinner every week with new recipes from your cookbook collection. You made me the broad-minded, adventuresome cook I am today. The crowd I spend Thanksgiving with, all bring something to the table for the holiday. The result is there is plenty of food, as there is at so many homes for the holiday. At the end of the night the guests are all making up plates taking a little of this and a little of that that from the dishes brought by others. It is a last pass through the line ensuring that nothing goes to waste. Each person is making up their plate for tomorrow’s lunch. If you run out of space, some are known to put a little dressing in a zip lock in addition to their plate of goodies. So though you may not cook, you will still get a turkey sandwich tomorrow. Though we all bring home leftovers, the most coveted thing was the ham bone and the turkey carcass. There were two families of two that split the turkey. It means that three families will use the timeless methods of using every last bite in making soups and stocks from what in many households gets thrown out with the trash. I got half a turkey and yesterday it spent cooking in the stockpot with celery, carrots, onion, and parsley until the bones were free of meat. I got four quarts of rich stock with lots of meat. I will freeze some for soup later on and use some to make creamed turkey to put on mashed potatoes and our leftover dressing. I wonder if the ham bone will be Senate Bean soup or split pea. Already I have made Minnesota Wild Rice soup. Though a soup, it is in the style of the universal Minnesota Lutheran hot dish. What this means is it is white, a cream based soup, with the wild and crazy spices of salt, pepper and onions! Serve it with applesauce or Jello salad and I am transferred back, at least in my mind, to Minnesota. I am ready to cook a pot of Navy Bean soup based on the version my mom used to make, jazzed up with a little more seasonings than she used. When I was a kid my mom would soak beans overnight, and then cook them all day with a ham bone the next day. At this elevation using dried beans is a challenge that requires not only soaking, but a pressure cooker or they will never fully cook. Because of this I actually cheat and use canned beans. I have learned in this case that there is a difference in generic beans and name brand. Name brand beans are not mushy or damaged, and if you are going to cook them for awhile with your ham bone, you want to start with firm beans. Since today we are looking for more fiber and more diverse proteins bean soup is a great option. Another soup on my to make list to make soon is chicken noodle soup. Of course my chicken noodle soup is not only made with veggies, and thick noodles, but also with my own stewing hens. One of drags of a stewing hen is that they are older and their muscle tissue fully developed. Today’s chicken is butchered in about 6-8 weeks and soaked in a water solution before being sent to your grocer’s shelf. There is no such thing as a stewing hen in today’s commercial food industry, and no real instructions for preparing such. What all this means is that the whole concept of stewing hen requires me to get out my vintage Joy of Cooking, and let that guide me. The result is a soup that is more intense, and chicken that never turns mushy. I am keeping an eye out for recipes in magazines, websites and on TV. I am sure that there will be a couple of new soups and stews that I will have to try. Maybe one or two will be a keeper the rest will likely be one time wonders.